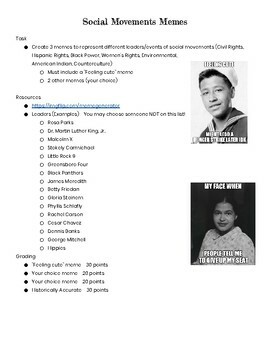 Students will create 3 different memes for civil rights leaders. They get to choose from different social movements such as the civil rights movement, women's movement, environmental, etc. One meme must be a "feeling cute" meme. 2 examples are included on the document. Sample rubric included. Don't forget to rate the resource to provide valuable feedback for how I can improve the resource, but also to earn TPT credits! These credits can be applied like money towards a resource.